Product prices and availability are accurate as of 2019-04-18 00:57:54 UTC and are subject to change. Any price and availability information displayed on http://www.amazon.com/ at the time of purchase will apply to the purchase of this product. With the innovative sit to stand adjustable height desk, it's easy to achieve long lasting health benefits like burning more daily calories, boosting productivity, improving posture and reducing risk of heart problems. The crank allows for effortless adjustment from sit to standing. Perfect for desktop, laptop or tablet computing. Mobile and adjustable to meet your everyday needs. The desk's work surface has a generous 59" wide x 29.5" deep shelf. Everything needed for assembly is included, Overall dimension: 59"W x 29.5"D x 29-42.75"H. Model and props shown are not included. This product meets the minimum requirements of ANSI/BIFMA standards. Physical/Global Health: Standing desks protect you from physical ailments, but why stop there? A Bamboo Electric Standing Desk will both improve your health and be eco-friendly by using pure bamboo, an easily replenished resource. 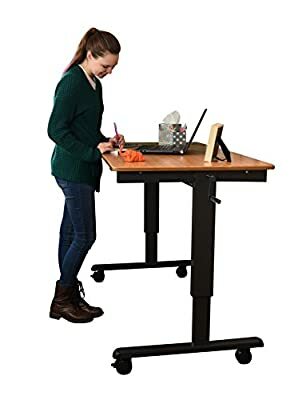 Simple Health: An electric standing desk makes choosing health throughout your workday simple; easily raise and lower from 29.5" to 45.25" in only 20 seconds. Sustainable: Bamboo grows close to 40 inches a day, making it the planet's most easily replenished wood. Calming: Bamboo brings a natural serenity to any environment with its calming tones rugged durability. Natural Beauty: Our UV-cured, solvent free Bamboo desktop is both aesthetically and naturally minded.